For many people, tomorrow is a bittersweet day – it’s Pet Memorial Sunday in the United States, a day to remember the animal companions who have crossed the Rainbow Bridge to join other pets waiting patiently for the day when they will see their families again. After the loss of a pet, you know that even years later you still cherish them in your heart. In some cities there will be memorial services or other events to mark both the solemnity and joy of owning a companion animal and then losing them. Pet owners will visit pet cemeteries or talk to others who have suffered the loss of a pet. At The Contemporary Pet, we host a Rainbow Bridge page to commemorate the loss of a pet. Whenever someone loses a beloved pet of any kind, they can post a memorial tribute here. 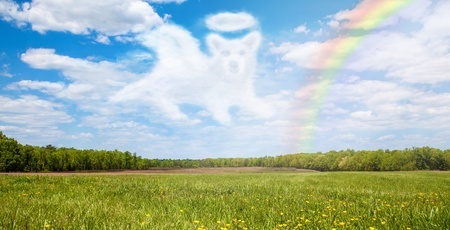 If you’ve lost a pet and would like to create a memorial to them, simply fill out the Rainbow Bridge submission form and upload a photo or image of your pet. You’ll also be able to write a short, heartfelt tribute to your pet. It’s our way of letting others know their pets may be gone, but they will never be forgotten. This is actually a very nice practice where commemorating the loss of a pet is held. This kind of service will surely help lots of pet owners that experienced or is experiencing pet loss.